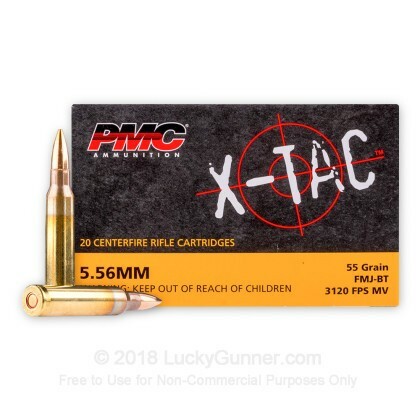 PMC is gaining popularity in the US market and has now come out with their own 5.56x45mm NATO mil-spec M193 round. This M193 NATO 55 gr FMJ round is manufactured to mil-spec and offers great accuracy for your AR-15 with the added benefit of being more cost effective than many of the American manufactured brands. It is loaded to NATO specs and is NOT intended for use in commercial or bolt-action rifles chambered for 223 Remington ammo - but is is perfect for your AR15! Please check with your gun manufacturer prior to purchasing this ammo (most AR15's are fine, but it is best to check first!). Each round is brass-cased, boxer-primed, non-corrosive, and reloadable. It is both economical and extremely reliable. 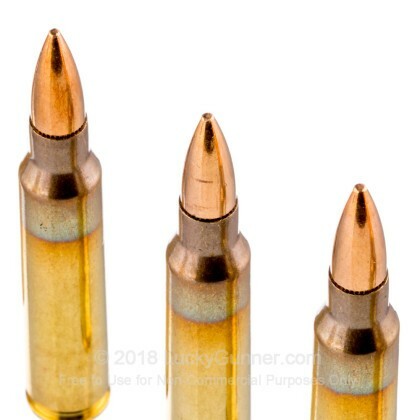 Just yesterday I was shooting my ar-15 and this was some of the ammo I fired and all I had was problems. It even seized up my trigger group because a primer made its way into the lower and there was even one stuck in the chamber at one point. I shot other ammo and my gun ran without a hiccup. I still have 200 rounds that I'll probably have to throw away because it's not worth blowing my gun up over it! Needless to say I will be buying only American made ammunition from now on! I have gone through about 600 rounds with only 2 fail to fires , quarter sized group at 185 yards with my M&P15. Semi clean firing ,will continue to use this at the range. Lucky Gunner ships fast and I have never had any problems with any of my orders this is why i only buy through Lucky Gunner. Thanks guys keep up the great work !!! I was a little unsure about this ammo due to the low cost. However, I had one jam out of 200 rounds and all appears very consistent. I will buy it again for sure. I have not had any substandard purchases of any calibers of ammunition from Lucky Gunner. shoots great and a very good price, fast shipping!!!! Good ammo for reactive shooting; not the most accurate load, but would purchase again. Flawless so far! Burns clean!! Very fast!!! It group well and I buy it again AOK. Great shopping experience Very fast Shipping!!!! I found this ammo more than adequate. I found this ammo more than adequate. .25 MOA! How much does a shooter need! Dirty? So what, you cycle 25 - 100+ through any barrel and it's going to need some TLC. If you don't have the energy, don't shoot. This batch of ammo functioned without a problem but it is dirty. I expended 100 rounds down range with good accuracy. It's cheap enough in price for me to use it anyway but now I know that the clean up will be extensive next time I shoot it. And on the plus side it is reload-able quality brass that I have gotten multible reloads from and with no signs yet of stress on the brass. This is pretty much the only ammo I run through my 14.5" piston AR. The exterior of the rounds are always high quality; no nicks, burs or particulates and brass is always polished. I use this for training under 100 meters and typically within 25 meters so I cannot speak to accuracy. I will say that I do not experience flyers so the ammo is consistent. Because I use a gas-piston system my bolt does not receive any fouling. The fouling/carbon buildup in the barrel is pretty much in line with most other .223/5.56 ammo. Also the box has police guys on it so obviously it is tacti-cooler than that boring box stuff. Lucky Gunner does it right! Recently I began using Lucky Gunner for all of my on-line ammunition purchases. I have been very pleased with the experience. 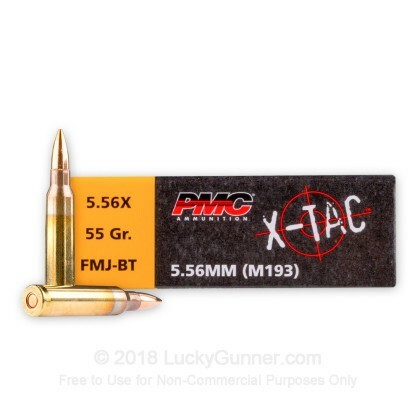 My most recent purchase was for 5.56x45 - 55 gr FMJ M193 - PMC ammo. 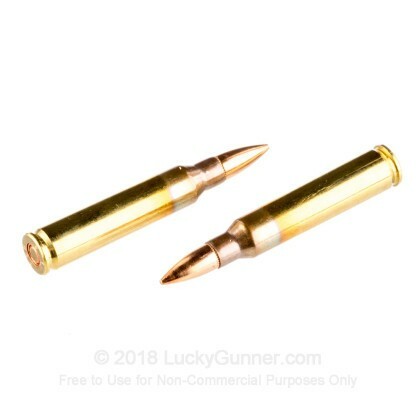 I rec'd the ammo in a matter of 3 days, and I am happy with its performance, as well as the price.....so now I feel like I am........a Lucky Gunner!!! I have been shooting PMC brand ammo for some time now, and it's all I buy anymore. Great quality and reliability! First experience buying ammo online. Paid less per round than OTC at my range. Only legal requirement was a fax of my state permit. Ammo delivered within a week, no hitches. Very pleased. This was part of my second order from the site. I was completely satisfied with my first order on price point, availability and quality of product. My initial order was for 200 rounds of Remington .223 which fired flawlessly through my ar-15. Now that I trust the site to deliver as promised, I will order other ammo for my ak, sig sauer, glock, and colt. Now I don't have to run around town trying to catch the deliveries from other places before all the ammo is gone. I used the 5.56x45 - 55gr to sight my new scope, all rounds fired gave a good grouping @200yrds. I'd buy them again. No problems with this ammo! Getting more soon! This ammo is great! Accurate, no problems feeding! Fired this ammo in my Mossberg MMR Tactical, no feed problems, no jamming problems, and ammo tracks quite true to target. Nothing wrong here folks, I recommend this ammo. Great service and shipping from Lucky Gunner as usual. Ran 300 rounds thru my AR, no issues at all in either rapid or semi fire. Rounds were accurate and fairly cleaning. A little more particulate in the barrel then normal, but breach mechanism and feed chamber were very clean so no complaints. Good ammo for the value and I will purchase more. I have shot 100 rounds with no difficulty. Shoots as promised. Great ammo, shot great in RRA-15 will worth the price. No issues with this ammo. Shoots fine in my MP15 and Windham AR15. Will buy again. Fast delivery by LG! 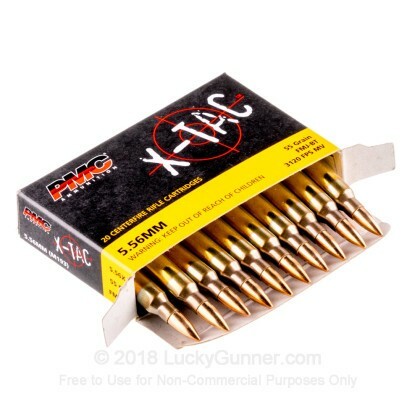 This ammo functions perfectly in my Ar15 and I will definetly buy more. i purchased 1000 round of this ammo. i've shot 200 rounds through my AR and 1 or 3 wont feed. tried different mags, tried different ammo, gun works perfectly. Fired 100 rounds of this ammo with zero problems. The grouping was awesome. This ammo looks clean and fires clean. Just ordered 1000 more rounds. A: Hello Tim! 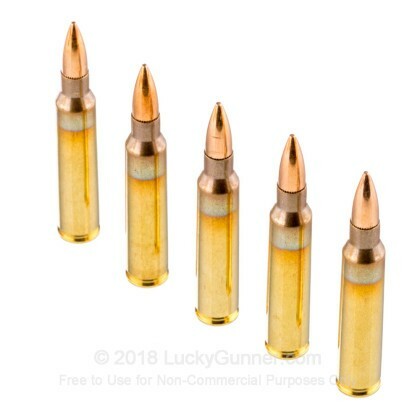 The PMC 5.56 55 grain round is a standard copper coated, lead core bullet. It does not contain any steel. We also have this 5.56x45 - 55 Grain FMJ-BT M193 - PMC - 1000 Rounds ammo in stock in a bigger quantity.